Comments Off on SCOUT. Click here to leave a comment. Following up on my earlier post about parking for expecting mothers (we know them well in these parts), I came across this Korean oddity: Special “women only” parking spaces. 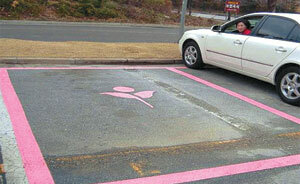 The “pink lines”, painted pink, are 2.5 meters wide rather than the standard 2.3, offering aid to women drivers unskilled at parking. I’ll reserve comment, as my jaw seems stuck to the floor. Comments Off on Pink Lines. Click here to leave a comment.